Facebook seems to have hit the right chord with users at long last. With falling Facebook users, a flop Facebook smartphone, a flop Facebook Home, the things were quite miserable at Menlo Park. But the Instagram Video has taken the tech world by storm. It had unprecedented popularity on the first day of launch with 5 million videos being upload in the 24 hour period. 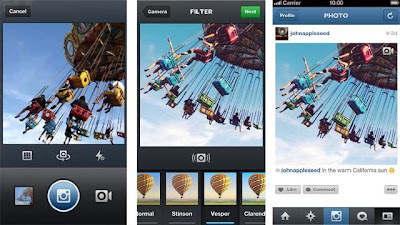 The above pic describes how the Instagram Video can be uploaded with filters,frames etal in three flat steps. And that seems to have worked the magic for Facebook. You can read all about Facebook's Instagram Video and download it here. After attempting to promote 'Vine' on the day of Instagram Video release, today Twitter released a update for Android devices for 'Vine' to clear cache memory. How is this useful. I will explain in plain vanilla English. The 'Vine' lets you play the 6 second videos in a loop which mean that they are first downloaded into your smart phones memory and stored and played natively. Hence you get the nice loopy video that you can watch. However, day in day out of downloading the 6 second videos means a unnecessary waste of memory. Vine does not have a limit for cache memory so pretty soon you will find out you have used a lot of memory. There was a workaround available to clear the memory but nothing like a within App button to clear the cache in a zip. Vine Engineers identified the problem and the new update gives you just that. A button within the App to clear the cache memory in a jiffy.